Oh boy, targeted instruction is a big one - so buckle up because we absolutely LOVE this topic. What does it mean to provide targeted literacy instruction? We know that students who struggle with literacy struggle because of difficulties in one or more of these areas. 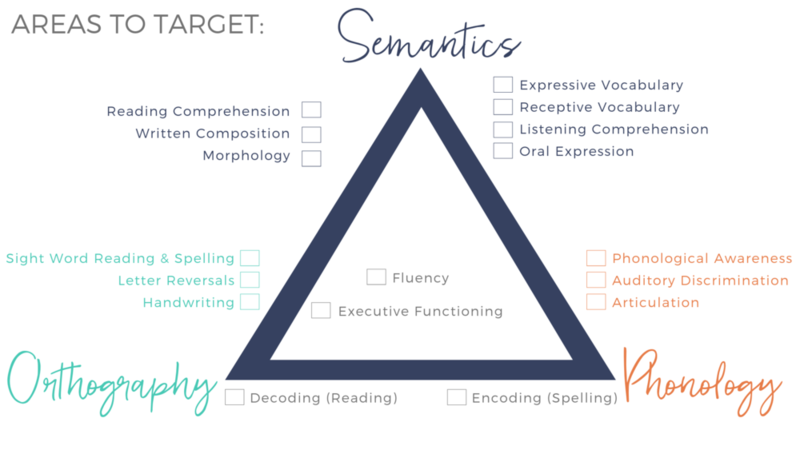 They struggle with phonology (understanding the sound structure of the language), orthography (understanding the visual structure of the language), or semantics (understanding the meaning structure of the language). How do I Make sure I’m Meeting my students’ needs ? 1 - You need to be tracking and measuring your long-term goals (the student’s increased ability to read and write most likely). This should be done with standardized measures that help you to see that Standard Scores based on the Standard Bell Curve are improving. This means not only are there raw score abilities going up but that they are closing the gap to catch up with grade-level peers. This is why it’s critical that at the very least formal standardized testing MUST occur in IEP triennials…at the very least. Ideally this would be happening every year or even every 6-months. You can typically tell that you have a standardized assessment because scores are provided as Standard Scores (Average of 100) with Percentile Ranks (Average of 50) and could be graphed on a bell curve like this. Students scores should be moving toward the right as you continue intervention. Word Identification & Spelling Test (WIST), Gray Oral Reading Test (GORT-5), Test of Integrated Language & Literacy Skills (TILLS), Oral & Written Language Scales (OWLS-2), etc. You also need to be tracking daily progress with daily tracking sheets like this! Which will help keep you on track recognizing IMMEDIATELY if there are skills that just are not sticking for your students. Stay tuned for an upcoming blog where we will walk you all the way through this process! 2 - You need to be thoughtful and strategic on exactly what you are targeting and why. Based on your intervention, and based on you choosing relevant therapy activities (you did that right? )…if you’re not quite sure on what that might look like you may want to download this visual to help target those goals! Check out our video here to get an idea of what this looks like and let us know if you have questions in the comments!